I decided to take Drew up to get ice cream, er frozen yogurt at the corner of our neighborhood as a treat for being such a good kid this weekend. He needed to be rewarded, as we spent most of weekend dealing with the behaviors of one tyrannical two year old Calamity and the most rambunctious puppy known to man. 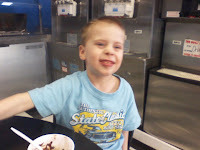 Of course he got his low fat chocolate yogurt with brownie bits, chocolate chips, M&M's and hot fudge, so it no longer was a "healthy treat", but still he deserved it. The grin on his face was enough to tell me I made a good decision. On the way home, I asked him what his favorite part of the weekend was. "The race," he replied, referring to the 5k I ran on Sunday, my first 5k that I have been worried about running for a year. I finally did it, and he was there to cheer me on as I ran. This [revelation] was surprising to me, as we had gotten ice cream AND gone to a birthday party this past weekend. "Aw, thanks buddy. Did you like watching me run? I was really happy you were there cheering me on." "Yeah," Drew replied, then after a moment of thought, "you finished kind of in lastish place, but there were people behind you, so I guess you weren't last." "Well honey, I ran because it was fun, and I wanted to try and do my best, and so I was happy with that, no matter where I placed in the race." "Yeah, but you were kind of last." I so was not, I was middle of the pack, but anyway.... " Well, not really. I had fun and did my best, and that's all that matters." "Well, did you get a medal?" "Er... I didn't pick it up." We had a mach 9 meltdown with an unnapped two year old that prevented my return inside the building to pick it up. It just wasn't worth it to go back, we had to go home. "Why?!?" This perplexed Drew more than it even perplexed Mr. B. How could I not care about a MEDAL. Those things are shiny, and big, and they hang down like a necklace, and they mean you are teh cool, right? "Well, it wasn't as important to me. I was happy I finished and did well for me. I didn't need a medal." In the rearview mirror I saw a perplexed five year old's expression of disbelief. I'm sure it didn't make sense to him now, but I hope one day he will get it, how it's more important to do your best than to worry about others. Maybe I finished "in lastish place", but I finished, and I ran more than half of it, sprinted at the end, and finished with a time I was proud of. I stepped out of my comfort zone, into something (running) that has always terrified me, and I completed it. For that reason I am proud of me.